The most popular wings of WWI was the Dallas wings, but why was it called by that name. None of the wing books or articles ever said why. What was the mystery? The Dallas wing was manufactured in New York, Phily and St. Louis so why was it called the Dallas Wing? I assumed as did many others because that is where it was sold to pilots who just finished training at one of the many airfields in Texas and before shipping out went to Dallas and bought one of the fancy wings. Well this is the end of that story. The real reason was it was invented and patented by two men in Dallas. Patent No. 1,282,471 dated Oct 22, 1918. 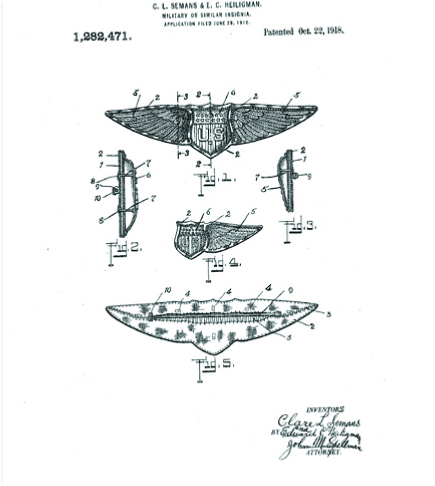 The patent was by Clare L. Seamans and Edward C Heiligman of Dallas, TX. The odds are they made all the manufacturers pay them a royalty and use the name Dallas.